The information below on Pierre Jaune is a selective summary of a study undertaken over several years for the canton of Neuchâtel by the Laboratoire de Conservation de la Pierre (EPFL) and later by the Expert-Center for Conservation of Monuments and Sites (Lausanne), in collaboration with the university of Neuchâtel. 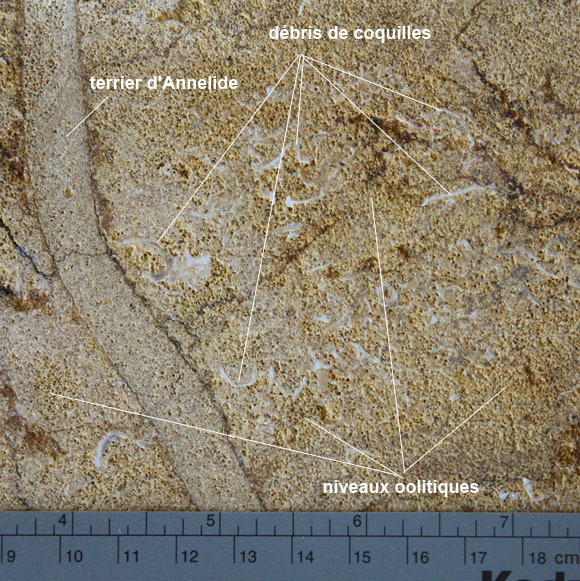 Geological definition The Pierre Jaune of Hauterive is both an oolitic and a bioclastic limestone (according to the rock classification, it is a (bio)chemical and (bio)biodetritic calcareous sedimentary rock). It is composed of calcareous debris that are consolidated by a calcareous cement. Test with acid Calcite (CaCO3), the main mineral constituent of limestone, reacts with diluted hydrochloric acid (HCl 10% = 2.87 M). This reaction produces CO2 gas, which is set free provoking effervescence. Attention !!! On buildings or statues, the test with acid can only be done on restricted and less-visible surfaces! In any case bring a bottle of water to stop the raction! Identification Oolites: spherical grains, more or less empty since often dissolved, diameter about 1mm, yellow to beige colour. Bioclasts : Fragments of shells from Lamellibranches and Brachiopods, fragments of Echinoderms, Bryozoa, Foraminifera and burrows of Annelides. 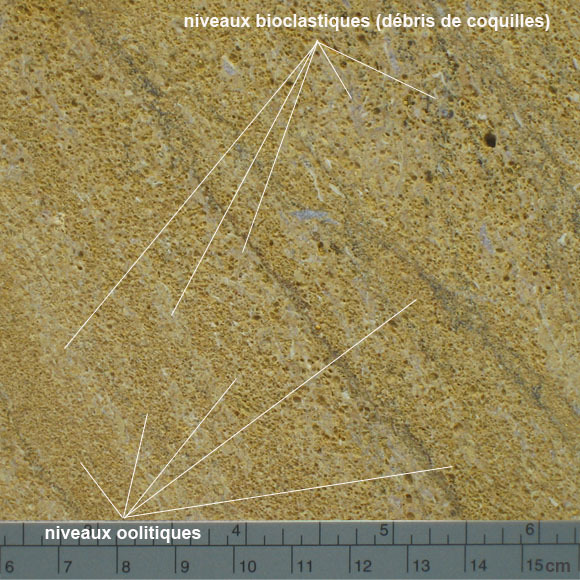 Physical and mechanical properies It is difficult to give characteristic values for a material as heterogeneous as Pierre Jaune, but based on the measurements made on stones used at buildings, its is medium to strongly porous (total porosity between 11 and 21 %vol.). Despite the high porosity, the absorption of moisture by capillary suction is low (specific capillary coefficient between 1 and 11 mg/cm².min½ and linear capillary coefficient between 0.1 and 0.4 cm/min½). These imbibition kinetics lead to only a minor filling of the pore volume (Hirschwald coefficient between 0.06 and 0.25), and it implies that it is resistant towards frost damage. 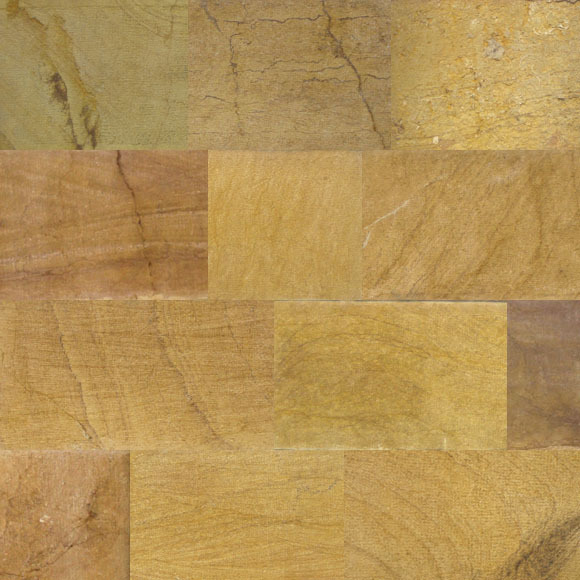 This is enhanced by its fast and efficient drying. Its good compression resistance (between 10 and 23 N/mm2), its very small hygric (between 0.2 and 0.7 mm/m in 72h) and thermal (between 3.4 et 11 x 10-6 mm/mm.°C à 70°C) dilatation are both technical characteristics which explain the very good durability of this stone. Nevertheless, observations show that Pierre Jaune is relatively sensible to alterations caused by salts, which probably explains why the bases of buildings made from Pierre Jaune are often constructed in hard and dense stone. Most frequent alterations Observations on numerous buildings made from Pierre Jaune show that the most frequent alteration are more of an aesthetic than a structural matter, like the brown patinas formed on elements not directly exposed to rain (example).